This is a handsome church in an otherwise rather suburban village. It was the goal of one of my first expeditions to Norfolk back in the early 1990s, when I went for a very long walk in the lanes around about. It was one of the hottest days of that summer, and I remember the dry, smoky Norfolk air filled with harvest dust. In those days, this church was kept open; but, frustratingly, today it is not. There are two keyholders, and although you no longer need to provide identification to get the key, you do need to write your name and address in a book. This is annoying, because it rather defeats the idea of a parish church being a safe haven for strangers and pilgrims, and makes it seem as if it is the reserve of the Sunday club. 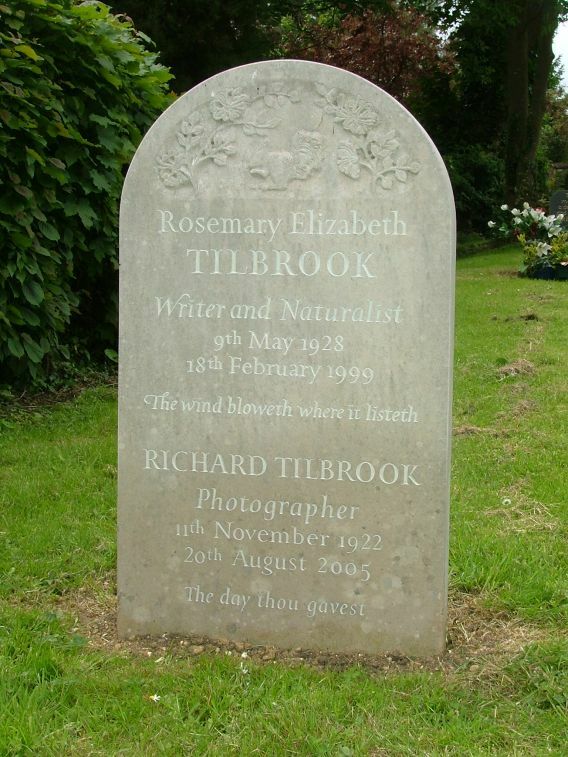 By the gate is the grave of the great church photographer Richard Tilbrook, whose books of Norfolk and Suffolk Churches Large and Small are still deservedly the standard texts for those wanting to see images of the buildings. 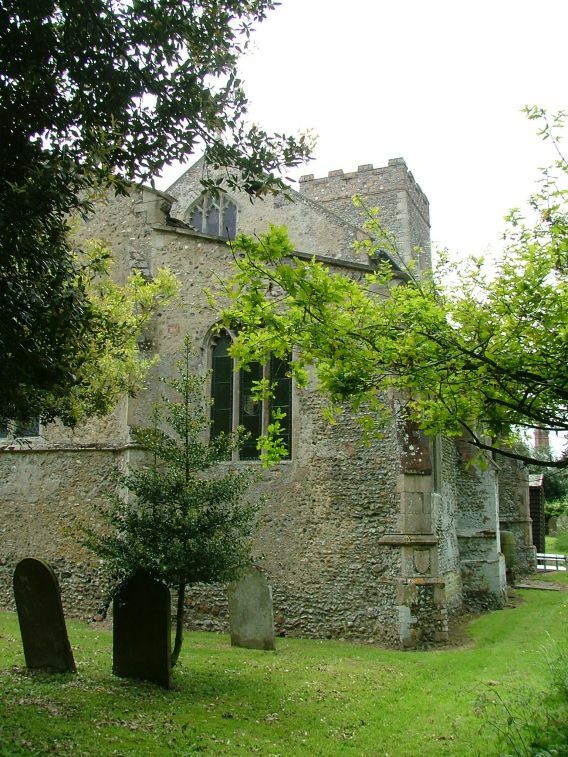 Bequest and burial evidence suggests that the whole church was constructed within forty years or so, starting in the later decades of the 14th century. The porch is high and open, with a parvise room above. The door handle is the original one from the start of the fifteenth century - if you look, you can see that the spindle is cast as a tiny dragon, grasping the handle in its mouth. You don't need to get the key to see this. The church has recently undergone an excellent restoration, and you enter a white-walled barn of a building, full of light from the clear glass of the windows, with modern chairs on beautiful brick floors. It is absolutely lovely, but if it was not for one particular feature, this church would be of little excitement to the historian. 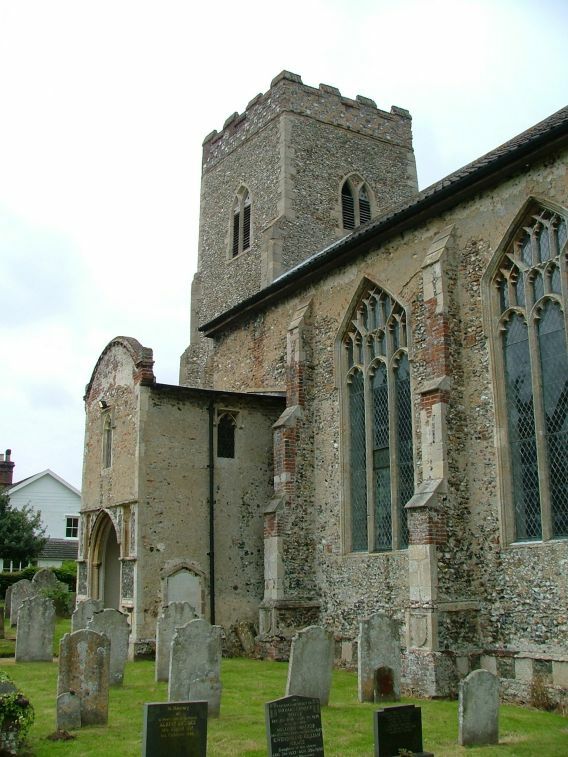 However, there is a north chapel to the chancel where members of the Thorp, or Thorpe, family are buried, and between the two lies Norfolk's most splendid alabaster memorial. It depicts Sir Edmund and Lady Jaon Thorp, both wearing the rare collar of SS, angels bearing Lady Joan's pillow to heaven, and two quizzical little dogs beneath their feet. The font has been repainted with heraldic shields. Pevsner dates it from the Restoration in 1660, and so no doubt it replaced a medieval font destroyed by the puritans. The chancel is cleared of all furnishings, and the sanctuary is simple, practical and beautiful. The remains of the screen are still in place, the dado on each side consisting of two wide panels and a narrow one. behind them, stalls which may retain their medieval popyheads are all that remain of the Victorian furnishings. 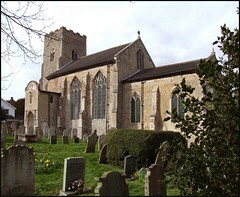 Ashwellthorpe church is a good example of a medieval building which, despite a considerable 19th century restoration, is now well suited to modern Anglican worship, while retaining an intense feeling of its past, a true touchstone. The parish is to be congratulated on the way that the church looks now, and they have shown just what can be done with a little thought. 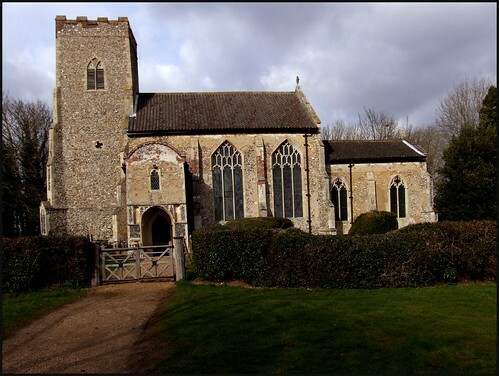 It is a salutary lesson to compare this building with the disaster at Ingham in Suffolk. A banner in the north-east corner of the nave suggests a Low Church enthusiasm, which may explain the locked door, but there is a great sense of the numinous here, of a spiritual space which really should be accessible to all.